The first performance of “Breakfast at Epiphany’s,” a drag show at Lillie’s restaurant in Times Square, brought cheers to the packed audience after a priest from neighboring St. Malachy’s Church had demanded that the brunch time extravaganza be cancelled. The “dragilicious brunch event,” planned by Michael Fratz and begun on Sunday, Feb. 24, was at the heart of the tiff between the Times Square church, also known as “the Actor’s Chapel,” and the Victorian-styled restaurant. The dispute started when Lillie’s management announced via a “Breakfast at Tiffany’s”-modeled poster, placed in front of the restaurant, next door to the church, that drag performer Epiphany Get Paid would be having a weekly show on Sundays. It was at the same time as mass at neighboring St. Malachy’s. The Rev. Richard D. Baker, pastor at St. Malachy’s, said he had at first assumed that the show was going to be something more inappropriate than it actually is. “On the surface it appeared to be something that it wasn’t,” he said from his office at the church. When the priest expressed his ire to the owners of Lillie’s, they decided to cancel the show altogether, but then rescinded that decision after Epiphany protested. The restaurant then decided to move the event to its Union Square location. But Epiphany was not going to be run out of Times Square. “This is absolutely serious, shutting down an establishment illegally over a drag show will not be permitted anywhere in NYC,” Epiphany said on the event’s Facebook page. The drag performer spread the word via Facebook and other media outlets to the gay community and whoever else would listen. Council Speaker Christine Quinn’s office got wind of the hullabaloo and decided to get involved. Her staff mediated a conference call involving Father Baker, Lillie’s owners and management, Epiphany and the show’s organizer. At the end of the call Lillie’s decided that the show would go on as originally planned at their Times Square location. Lillie’s owner Frank McCole spoke about the restaurant’s stance on the matter, “We celebrate every creed, every sexual orientation, every nationality. We’re all about having a good time,” he said. 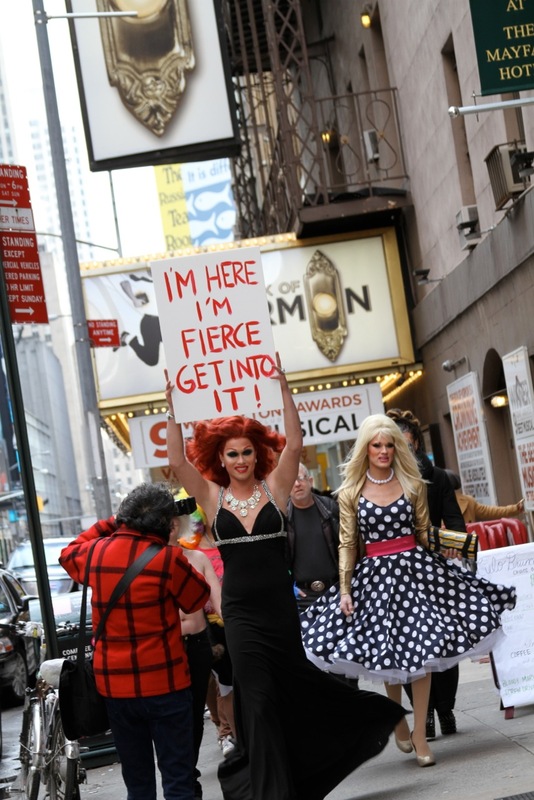 Earlier that day Epiphany, 31, and a handful of drag queens and supporters took part in a “March of Solidarity” from the TKTS booth in the middle of Times Square to Lillie’s at 249 W. 49 St. This was a tiny percentage of the 240 people who on the event’s Facebook page had said that they would attend the march. But not to be deterred, the vocal crew marched on. “I don’t sexualize any of this. I see it as a practice or an art,” he said. Representatives from Quinn’s office were present, including Quinn’s father. They sat in a corner booth and appeared to be enjoying the show. From the street, the only visible evidence that anything different was happening inside Lillie’s that day was a small police vehicle, which had been stationed outside both establishments since 11 a.m., that day. 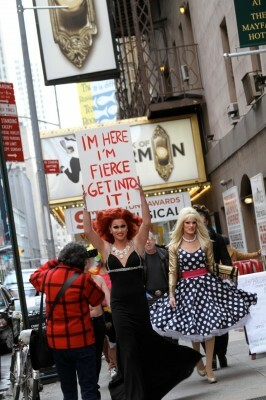 Opening the show was another famous drag queen, Ivy Winters, who appears in the current season of Rupaul’s Drag Race, while DJ David Serrano spun the tracks. Epiphany, whose real name is Calen Tomaszewski and who lives in Williamsburg, Brooklyn, has been performing for 10 years. Epiphany also performs at Industry, Therapy and XO, among other places. It was just days ago that this DUMBO gallery was packed with people admiring their representation of the neighborhood through photographs, film, sounds, and charcoal drawings. Now, Faranu and Mike Redman walked around as they looked at the vacant area they once called their studio. It’s only fitting they thank Bose Pacia art gallery because this wouldn’t have been possible if it wasn’t for the gallery’s unique program. Launched in January 2012, Transparent Studio is a visual arts program founded by Bose Pacia and is hosted in its gallery space. Applicants are chosen for the studio program through a submissions process based on project proposal and artistic merit. “We found there was a need for space for emerging and mid-career artists,” said Sadia Rehman, director of Bose Pacia. For the past 20 years, Bose Pacia has been a commercial space that specialized in South Asian art. It brought South Asian art to the United States in 1994. Since then Bose Pacia has been able to fill a niche that wasn’t there before. The owners felt something else was needed and wanted to try something new. They went about it by running Transparent Studio, in which the public and artist are encouraged to interact with each other during the artists’ progression in their work. “We wanted to do something experimental in that it’s an open studio. The public is invited to come in and view the artist process and ask them questions while they’re working,” said Rehman. On average, Bose Pacia receives around 200 to 300 applications. There is no fee to apply and there is no charge when the space is granted to the artist. The only thing that is required is for the artist to cover the cost of supplies for the work. Now, Bose Pacia is transitioning to a non-profit and closing down the commercial entity.. 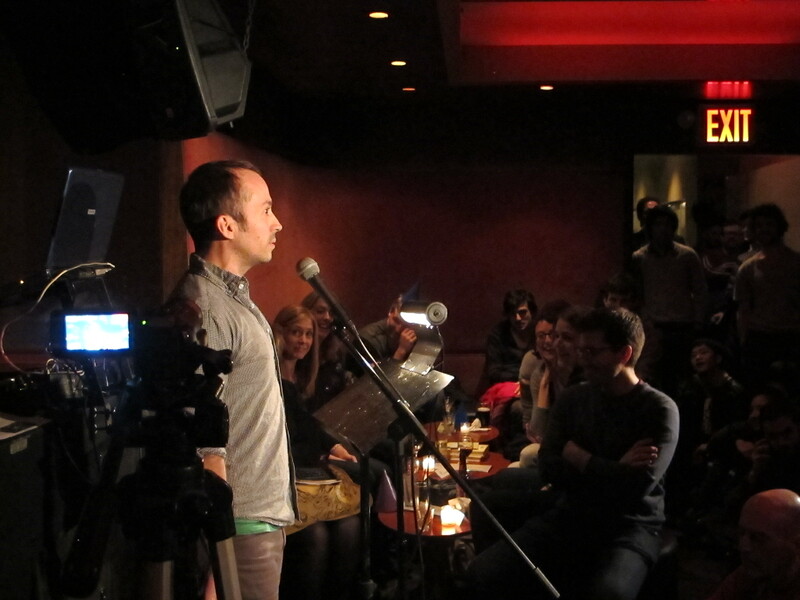 Writer David Crabb entertains audience with his coming-of-age story in the How I Learned series at Happy Ending Lounge on Broome Street. Photo: Ashley Balavender. The storytelling series How I Learned celebrated its four-year anniversary on Wednesday at Happy Ending Lounge in Chinatown. Coming back from a brief hiatus, the monthly series produced by writer Blaise Allysen Kearsley featured five New York writers: Katherine Lanpher, Kambri Crews, Ted Travelstead, Elicia Berger and David Crabb. Attendees sipped cocktails and donned party hats, sitting cross-legged on the floor and leaning against the walls as each performer told a story about a lesson learned. Storytelling events like How I Learned are quasi-social events where literature meets comedy meets performance. Writer David Crabb had the audience laughing with his performance of his well written story about coming of age as a gay male in Texas. The keys to a well-received story are similar to those for a well written one: detailed descriptions, dialogue, a climax and a powerful conclusion. However, Kearsley makes the distinction between good writers and good storytellers. “I think this kind of show demands that you know how to read your work for an audience,” she said. Kearsley scouts extensively and weeds through countless submissions to find performers for the How I Learned series, which takes place at 8 p.m. on the fourth Wednesday of the month at Happy Ending Lounge. How I Learned has also recently developed a podcast. Happy Ending Lounge, located at 302 Broome St., hosts several reading series each month. Award-winning writers Erica Hunt and Julia Jarcho visited Brooklyn College to read excerpts from their publications and discuss the process of crafting literary works with Theater MFA students. Both writers met in a classroom Wednesday night filled with students and faculty of Brooklyn College and read excerpts from their works. Among the pieces was Grimly Handsome, Jarcho’s most recent play, which has received a lot of media attention since its premiere because of how it explores the human psyche on an animalistic level. Jarcho has been a playwright for over a decade now; her first production, Nursery, premiered in 2001 in Manhattan’s Cherry Lane Theater. Hunt is an esteemed poet who has been writing since the ’70s. Her writings deal with language and the meaning behind it. “You want a coherence that goes beyond personal acquaintance. You want it to actually go beyond what your voice isn’t and actually have a life that travels,” she explained. She read through several of her poems, each more so than the last waxing philosophically about the worlds that exist inside words. The discussion ended with Hunt and Jarcho describing what they felt was most influential in piecing together their own writings. Hunt named two recent theater productions as inspiration. One was Fiona Templeton’s 1990 production YOU- The City, a performance in which actors took individuals around the lower Manhattan area while performing monologues addressed to a single audience member.